Ctesibius (Greek Κτησίβιος) of Alexandria, Egypt, is a Greek inventor and mathematician, the first great figure of the ancient engineering tradition of Alexandria. He is credited with a number of inventions, including a water pump, a water organ, a more precise water clock, and bronze spring and pneumatic catapults, several automatic machines, etc. His work is chronicled by many later inventors, e.g. Philo of Byzantion, Vitruvius, Athenaeus, etc., who repeatedly mentioned him. Ctesibius was cited as late as in 5th century AD by Proclus Lycaeus and in 10th century AD by Hero of Byzantion. Ctesibius lived most probably between years 285 and 222 BC. He wrote the first survived to the present treatises on the science of compressed air and its uses in pumps. This, in combination with his work on the elasticity of air—Pneumatica, earned him the title of father of pneumatics. None of his written work has survived, including his Memorabilia, a compilation of his research, that was cited by Athenaeus of Naucratis in 2nd century AD. Unfortunately, very little is known of Ctesibius' life and work. Ctesibius was the son of a barber from Aspondia in Alexandria and according to the tradition, the youngster worked in his father's barbershop. It seems his first invention was a counter-weighted mirror and was made during his barber period. In the barbershop he constructed an automation—a mirror, fixed on one end of a pole and a lead weight, weighing the same as the mirror, was on the other. This acted as a counterbalance and enabled the mirror, using some system of rods, to adjust to the height of different customers. Ctesibius had the lead counter-balance weight running inside a tube and noticed that as the counterweight moved rapidly through the tube, the compressed trapped air which escaped with a loud noise. This effect provoked his curiosity about both the powers of air, and musical instruments, e.g. water organ, and will result in his famous Pneumatica. Some historians suppose Ctesibius was a favorite of the king of Egypt Ptolemy II (also known as Ptolemy II Philadelphus, who ruled from 283 BC to 246 BC), who supported the inventor, while others claim all his life was miserably poor. Ctesibius is said to have married to a woman named Thais. In addition to inventing the water organ (hydraulis) and suction pump, Ctesibius also perfected the first accurate water clock (see the upper image). Previous water clocks did not keep precise time because the flow of water to the clock could not be correctly regulated. Ctesibius first fashioned orifices of gold or other substances which would not be worn by the action of water and did not collect dirt. 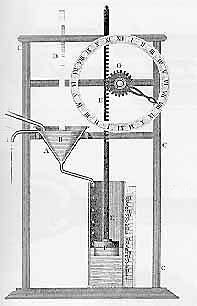 Having guaranteed an uninterrupted water flow into the first chamber of the clock, Ctesibius then devised a way to keep the water level in that chamber constant. An automatic valve, worked by a float, shut off the supply when the water in the chamber rose too high and opened it again as soon as enough water had drained into the clock's second chamber. The flow of water from the first chamber to the second, consequently, was always the same, and the passage of a certain amount of water represented the passage of so much time. On the simplest of water clocks, elapsed time could be determined by noting the markings on the side of the second chamber. More elaborate water clocks had complex and imaginative ways of denoting the time. Ctesibius is known also for several other discoveries, e.g. cannons operated by compressed air and a hydraulic hoist, capable of raising very heavy weights. 1. A singing cornucopia, incorporated into the funeral monument erected by Ptolemy in honor of his wife and sister Arsinoë in 270 BC. 2. A cam-operated statue of the mysterious deity that figured prominently in the famous Grand Procession, where it carried out a continuous performance, entertaining the festival crowd by standing up and sitting down. The excitement produced by this very simple application of a rack-and-pinion gear may well be due to the fact that toothed gear wheels were a recent invention, which almost certainly meant that their possibilities were still being explored (there is a passage in the Aristotle's Problemata (a multifaceted text asking various questions about medical, scientific or everyday topics), in which Aristotle finds the reverse motion created by two intersecting cogwheels intriguing). Ctesibius is considered the founder of the Alexandrian school of mathematics and engineering, and was probably the first head of the Museum of Alexandria.